We left General Santos City early in the morning and took the first trip to Davao City to catch our flight to Puerto Princesa. We arrived in the airport two hours before our scheduled departure. The plane left on time, in fact it departed around 15 minutes before the ETD. It was my first time to visit the beautiful island of Palawan. When we were about to deplane, I was very eager to take photos of the airport and so I took my camera from my bag only to find out the battery was not there. I can’t believe I left the battery at home! I was disappointed I did not check it when I left home. It was a major disappointment, but instead of ruining my vacation I decided to just take photos with my phone. Low quality maybe, but a photo is a photo no matter what. My friend Coco, also has an iPhone 5 so basically it’s not really bad at all. Upon arrival at the Puerto Princesa airport, we asked the tourist police where can we book a ticket for our PP underground river tour. Unfortunately, the tours were fully booked and the earliest we can get will be on the day we will be flying out of PP. So, we decided to go to El Nido instead. From the airport, we headed to Robinson’s mall and had our lunch. The tricycle at the airport asked us to pay P100 so we thought it was kinda expensive so we went out of the airport vicinity and we were able to catch a tricycle for P50. After we had our lunch, we scouted for cheap battery for my camera. Sad to say, the battery cost almost P2,500 so I decided to just get over it. 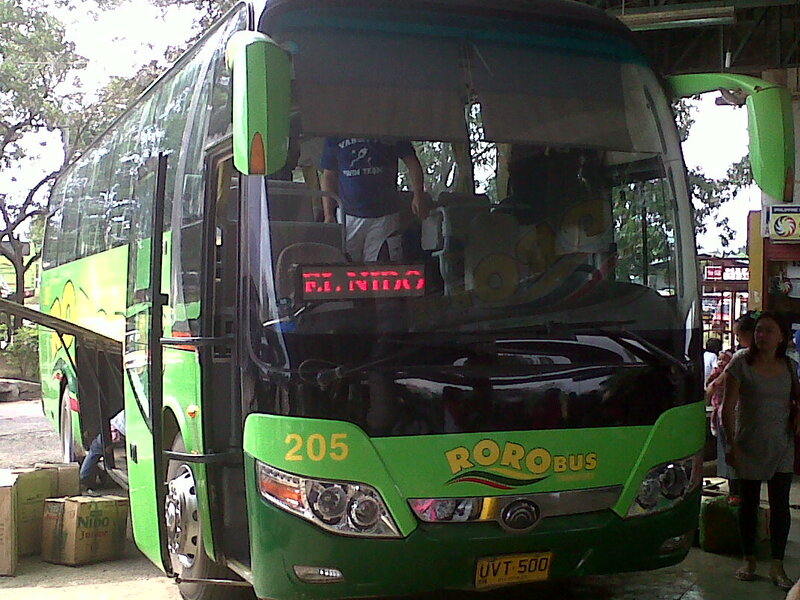 We took a tricycle and proceeded to the bus terminal and took the air-conditioned RORO bus bound to El Nido. We arrived at around 12:30 PM and the next a/c bus would be 2PM so we had plenty of idle time at the bus terminal. We arrived in El Nido at around 8PM and we immediately hunted for a place to stay. We asked the tricycle driver to drop us at a place where could possibly stay, unfortunately most of the inns at the beachfront were fully booked already. We walked around and we found Casa Cecilia. It was also fully booked but luckily, a guest has cancelled so we were able to stay there. We freshened up, had our dinner at a nearby restaurant and we called it a night. We were excited for the next day’s activity – island hopping, woot!